According to some estimates, more than 90% of the world’s data has been generated in the last 5 years. Of course, this is a difficult to define measure that calls to question the nature of recorded knowledge. However, the point remains that in just a few short years, humanity (and machines) have started to generate unfathomable amounts of data about everything from our health to our shipping preferences, travel habits, schedules, and our love life! Throughout Too Big to Know, Weinberger (2011) stresses the abundance of knowledge available in a networked world. I believe that the exponential trajectory of technology and data growth will continue for many years to come. Our generations will exist entirely in technological and social flux; change will become a fundamental aspect of our epistemology. As leaders, teachers, and innovators, it is important that we understand how media and technology evolve indistinguishable from the social/cultural incubators in which they develop. This semester, I’m teaching one of my favorite classes, “Mass Media Communications” in which a constant recurring theme is the media economic cycle (Vivian, 2008). We’ve used this throughout the semester as a framework for investigating how various media works, and why it impacts society in the ways that it does. Vivian suggests that there are 6 broad steps that each medium goes through (if it’s successful): invention, entrepreneurship, industry, maturation, and the defense of infrastructures. I believe that we can apply this framing to the future of digital technology so that we can be aware of all the ways in which it can/will impact our organizations or students. For example, invention and entrepreneurship continue to disrupt the ways in which we do business. As the “tool assessment” assignment demonstrated, there are hundreds, if not thousands of new tools and technologies emerging every day. Many of these will not make it past the entrepreneurship stage for a variety of reasons. We must develop a refined sense of digital literacy so that we can effectively filter forward (Weinberger, 2011) the valuable tools from the junk. Effectively handling the barrage of innovation will (has already) become a duty of the responsible contemporary leader. When a technology reaches significant enough adoption, you can see the supportive cocoon of industry grow up around it. 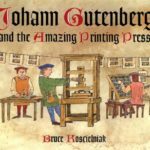 After Gutenberg invented the printing press, the demand for ink, paper, metals, and skilled pressmen increased (and in the case of the press operator, came into existence!). As the industrial revolution mechanized printing, those demands continued to grow into a complex network of professionals, materials, production methods, and consumption habits. As leaders create and implement strategy for organizations, thinking should include analyzing the opportunities present in the emerging industry. What are places in which you can expand market share or increase the competence of your team? Of course, technology – specifically networked systems – are filled with links (and few “stopping points”) which are permission free and always available to the public (Weinberger, 2011). In this way, leaders can become facilitators of knowledge, helping to build the right networks, fostering optimal cultures and posing good questions. I do not believe that the digital age has matured yet. I feel like we are digital teenagers, racing down the “information superhighway.” Sure, we follow most of the rules, but still make some rash, irresponsible decisions. Weinberger’s (2011) suggests that the net is (and may forever be) unresolved (p. 174). Organizations are adopting technology for the sake of keeping up, or creating a Frankenstein’s monster of new systems in old infrastructures. Commercial banking, for the most part, still operates on foundational systems from the 60s and 70s while at the same time, trying to disrupt business models with innovations like blockchain. This video from Corning shows off some of the ways in which technology will eventually become more naturalized. The ways that we use technology today still feel foreign. UX is getting better, but many systems still have a learning curve, parlance, and set of knowledge needed to use them. I think a hallmark of media maturation is its total normalization (and ubiquity) to a point where the technology disappears. Leaders can continue facilitating systems design and digital literacy in order to make using technology less of a novelty and more of an extension of ourselves. Finally, leaders must be keenly aware of the ways in which the “next big thing” will disrupt our operations. As noted above, by staying aware of changes in surrounding/supporting industries, leaders can try to predict where innovation will appear. With strategy and some luck, we might be able to put ourselves and our organizations in a strong position to defend the infrastructures that support us. At the same time, I believe that a good leader also knows when to let go. Vivian, J. (2011). The media of mass communication. (10th ed.). Boston, MA: Allyn and Bacon. Nice post, and I like your framing construct. When it comes to technology, we need to follow Gretzky’s hocky advice = “Skate to where the puck is going, not where it has been.” And part of that – as you note – is letting go of old (procedures/technology/routines) to take on something new. Thank you, Dr. Watwood- I love the hockey quote! The leadership challenge of the digital area will be anticipation and change management, I believe. I really appreciated how you used Vivian’s 6 steps to analyze the future of digital technology. The steps broke your assessment up nicely. You mention the responsibility a leader has to monitor and filter the barrage of innovation. I keep finding myself overwhelmed. Are there some specific techniques you recommend to stay current? Finding the time needed for curating is difficult. I appreciate Dr. Watwood’s Gretzky reference. And feel I want to skate to the puck and let go of the old. But I see so many pucks. Which one should I skate toward? The challenge of minimizing negative impacts of tech is daunting. In many ways, I am an advocate for a “live and learn” approach. I recall that as a teenager, my parents tried to encourage me to learn as much as I could from my mistakes. As the 4th child of 4, I was given a tremendous amount of freedom and independence (my eldest sister still complains that I was allowed to do whatever I wanted!). With that, however, came higher expectations and an understanding that I would have 5 sets of eyes judging my every stupid immature choice. I made those mistakes anyways, and I feel that I have learned a lot from the practice. You and I have written on cultural vaccination, and I think that technology needs the same. We must fail in order to see what we need to fix. Unless the symptoms of technology’s ills present themselves to us, we cannot diagnose the disease. Without the diagnoses, we cannot protect ourselves against further harm. For example, we see new ethical questions arise from technology almost daily. While perhaps someone has suffered as a result, the experience sheds new light on a potential problem area. In this case, I think that we as the first generation of digital citizens occupy an incredibly important role. We must act like the proverbial oldest child: setting a good example for younger digital natives, making smart choices in tech, and maintaining a healthy balance of on and offline life. I love this discussion and am a big believer in how much we stand to learn from failure. This week’s post for some reason has me thinking a little more about a downside to our evolving world…technological advancement includes greater consequence when there is a failure. Where perhaps that means we stand to learn much more, it also seems we risk losing everything. Do you have any thoughts on how we reap the benefit of learning from our mistakes without making a mistake so big it cannot be fixed? https://theayeshaveitblog.wordpress.com/2017/02/23/implications-of-emerging-and-changing-technology-in-higher-education/). It appears that blockchain will continue to evolve if it is to be leveraged to manage large sequences of data, as described in the article “IBM Deploys 400 Blockchain Projects, But Perspectives Are Unclear” (https://cointelegraph.com/news/ibm-deploys-400-blockchain-projects-but-perspectives-are-unclear). Just think of the possible impact of a technology not even imagined ten years ago! CatOnKB – thanks for providing some great additional references for this conversation. The blockchain idea is fascinating for me, and I think, like many other new technologies, the lay person really has no idea about the implications, possibilities, and problems with its deployment. Another example that I think works the same way is that of cloud computing. The “cloud” had/is having huge impacts on web and application development, but most people have no clue how or why it works. The Cloud and Blockchain are two examples of innovations that won’t get much press outside of tech circles. I wonder if the average user will ever stop to consider how their lives are different with such incredible technology? Or, like we do with television, will future users simply take it for granted?